We are experts in mould removal and mould damage cleaning and restoration, with a team of specialised restorers certified by the Institute of Inspection, Cleaning and Restoration (IICRC) in Applied Mould Remediation. 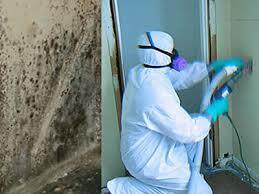 We follow the IICRC global standards in all the mould removal, cleaning and remediation programs we undertake. From our perspective management of mould contamination in one’s home or work environment is an emergency and we respond with our 24×7 emergency relief service; where a Mould Remediation Technician will aim to commence the assessment, make safe and mould remediation and clean-up program within one hour from your call across any part of Melbourne. What is Mould and What is the Best Way to Manage It? Mould is a fungi and is created and reproduced through tiny spores that travel through the air and attach themselves to wet and damp surfaces. It likes warm, moist environments and needs some organic matter (such as wood and dirt on surfaces) to feed off. It can also digest synthetic materials like paint or other types of adhesives. The most effective way to reduce mould growth in your home or business is to remove excess water and control moisture and humidity in the process. All of our Mould Remediation Specialists are also certified Water Damage Restoration Technicians and are able to determine the best way to remove water build up and mange humidity. By addressing the root cause of water damage, your current mould issue should not reappear once it has been managed. Mould issues many not always be immediately noticeable, so if you are suspicious or have noticed water ingress or the beginnings of mould contamination around your home or business, call us now before the mould spreads, increasing your repair bill and your exposure to health risks. 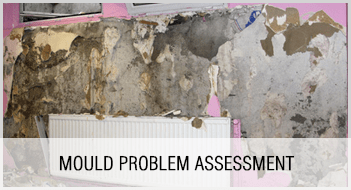 Mould Contamination Assessment | Our first step is to always assess the mould damage and use our specialised instruments and monitors to map out the extent of the damage. We aim to identify the root cause of the mould problem and recommend the best way to address it, so that the mould issue is not a reoccurring one. Where required we can also organise mould testing in the lab. Define Scope Of Works | We carefully plan how to remove the mould, clean, disinfect and repair the affected surfaces and materials, as well as how to stop the root cause. We can provide detailed assessments and restoration process outlines to your insurance company to support any claims. At this stage we can provide fairly accurate outlines of estimated costs and the time required for the different phases in the mould remediation and restoration program. Address Water Ingress Issues| We aim to stop the water ingress causing the dampness stimulating mould growth. This could be a leaking pipe or leaking roof issues, leaking gutters or facia, or even poorly sealed windows and doors. It could be the outcome of poor drainage or sub-floor ventilation, or it could be from rising dam issues. We can organise for all types of water ingress issues to be addressed. Contain Mould Issue | As required, we seal off the affected areas to avoid the further spread of mould during the mould remediation process. Kill and Remove Mould Contamination and Mould Odour | We commence the removal of mould using the most appropriate method in line with the type of mould identified, the type of surfaces contaminated, the degree of mould contamination spread and the amount of time it has been present. 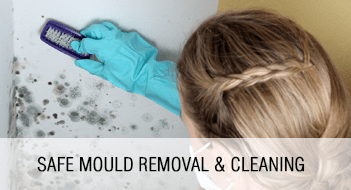 Some minor mould issues can be addressed using the correct cleaning treatments to remove the mould, other surfaces may be deemed to be non-salvageable and the mould must be cut out and disposed off according to industry guidelines. HEPA vacuums are used to remove mould spores from upholstery, carpets and other soft and hard surfaces that may have been exposed to the contamination. Air Purifiers are used through the process to capture the dead mould spores from the air and so totally removing them from your environment. We clean all surfaces and materials exposed to the mould and dispose of any non-salvageable items. Drying Program | Once the mould clean up and removal is finalised we then undertake to dry out the affected environment to remove excess water and moisture in the air and ensure the building is left dry, avoiding future issues of mould. 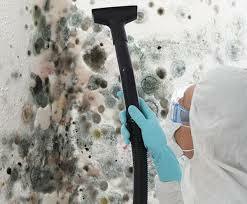 It is however important that the root cause has been addressed to remove the risk of future mould growth. Structural Restoration | Our certified Mould Remediation and Water Damage Restoration Technicians are skilled to manage the mould remediation and restoration program end to end. From demolition work through to restoration. We can organise for structures to be rebuilt, replastering and painting. We repair water damaged roofs and ceilings and provide solutions for water ingress issues. We have a network of processional trades that understand water damage and how to best manage repair or constriction. Reporting |We are able to provide final reports of work undertaken and the justification behind actions taken. This reporting assists with insurance claims and lends itself to a quicker and smoother settlement process. We are happy to work with assessors and loss adjusters and understand their requirements. Take Caution Around Mould In Your Home Or At Work. It can be dangerous to your health. At Capital Restoration Services we know that mould can be very dangerous to human health, particularly black mould, this type of mould could be fatal. It is often the root cause of many health issues such as allergies, asthma and other respiratory health issues. Mould growth spreads quickly and is fast in contaminating all surfaces and materials it touches, including clothing, furniture and other valuables. Call us 24/7 on 1300 554 418 to access your mould damage issue, we will be happy to discuss your specific issue and how we can assist you to address it promptly and cost effectively.